I had her for only 7 years, but in that short time she changed my life. She was a chestnut Arab-Thoroughbred mare named Fahleen. A clown, a sassy, naughty redhead, she had a unique sense of humor as well as tremendous athletic ability; she was the best long-distance range-riding horse I ever owned. She had a lot of determination and heart. She came into my life on a cold day in March 1967, as a wobbly legged filly with an irregular marking on her short face. 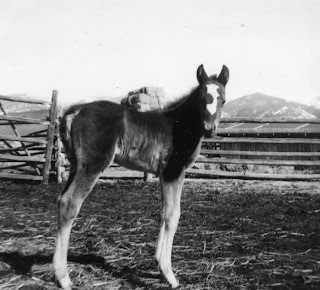 As a young foal she was exasperating to handle. Her Thoroughbred mother, Nell, came from a long line of very independent equines, and Fahleen was a challenge to train. I had to earn her respect, and it took several years. In reality she was training me. As time went on, she came to accept and tolerate me and then to think of me as sort of a second mother, trusting me as completely as I trusted her. After I’d ridden her for a couple of years, our relationship was well grounded in trust. I could do anything with her that she considered reasonable, and we were a team. Our first years together, however, were very trying, partly because of her unique sense of humor. She just didn’t think like a horse; she was more like a monkey and seemed to receive great delight in testing me.